Sources said a bilateral trade package is being worked on. 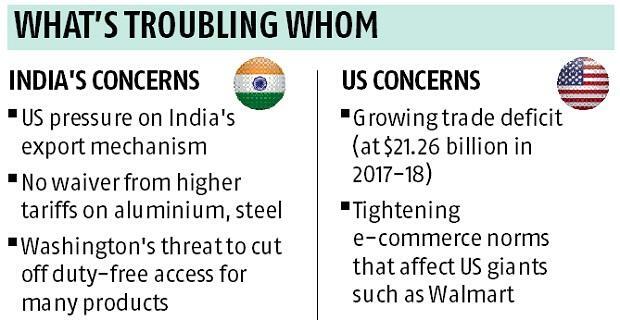 This will include changes in import duties on US information and communication technology products, and preferential tariffs for Indian exports, apart from data localisation norms. However, the upcoming talks will steer clear of this, as US policy dictates that only the powerful United States Trade Representative’s office discuss such matters, an official said. India’s relation with its second-largest trade partner has been choppy during the Donald Trump presidency. While exports to stateside have grown — $47.87 billion worth of Indian shipments reached US ports in 2017-18, up from the $ 42.21 billion a year before —America’s irritation with a wider trade deficit has also grown.